HMS MERSEY (P283) is a River-class offshore patrol vessel, built by Vosper Thornycroft, launched on 14 June 2003 by Mrs Jennie Reeve and commissioned on 28 November 2003. She is the fifth ship to bear the name in Royal Navy service. With a complement of 42 personnel, a length of 79.9 metres and a displacement of 1,677 tonnes her top speed is 20 knots. HMS MERSEY is a fishery protection vessel and her primary task is patrolling the United Kingdom’s waters, enforcing national and EU fisheries legislation. She is able to patrol for 300 days per year. 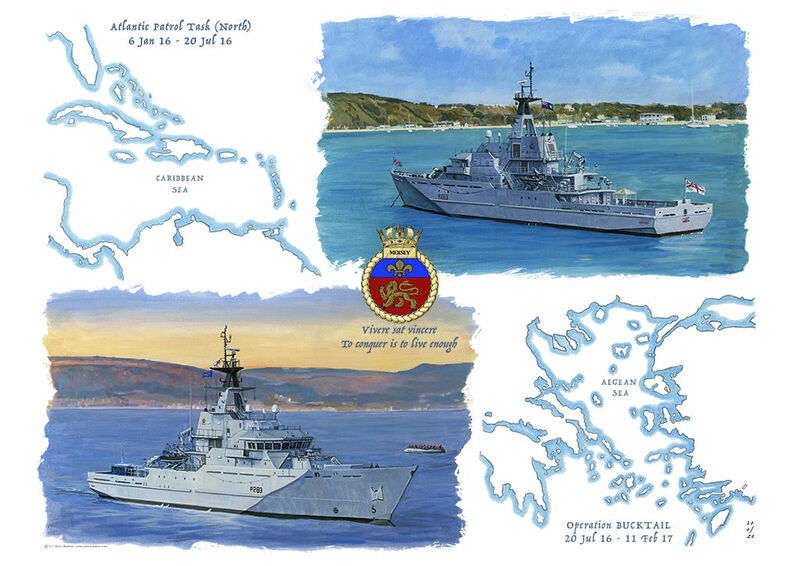 The picture was commissioned in 2017 by the officers of HMS Mersey as souvenir of a busy year in 2016 when she was deployed in the Caribbean and then in the Aegean.